Being 5 months pregnant at the time I knew I needed some help and I immediately thought of Kathryn from House of Hawkes as I knew from our first meeting that our styles perfectly blended and complimented each other and she is a lovely person to work with. I had recently purchased a new white linen sofa (not perhaps the most practical for our new arrival in July!) 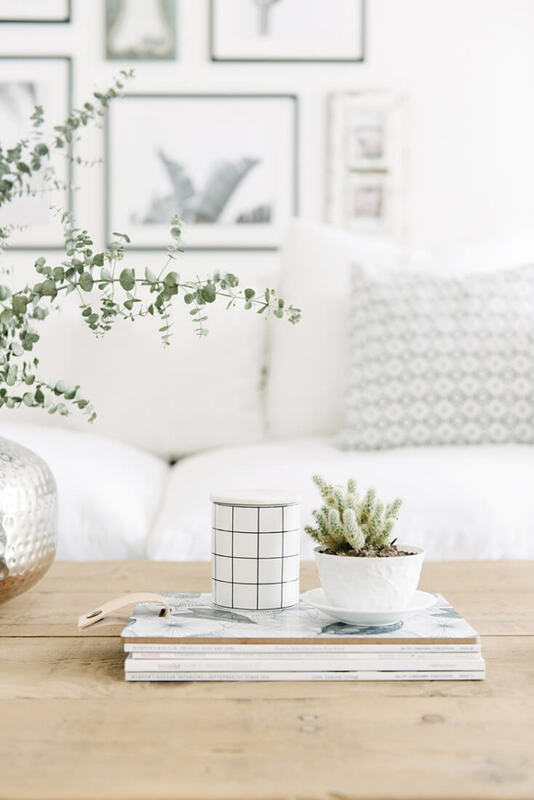 and a new custom made coffee table from my favourite carpenter in Dubai and I had a whole warehouse of new White Moss goodies which Kathryn was eager to raid to complete the look and create a beautifully tranquil space. We installed two Raffia Island Pendant Lights in the living and dining area for an earthy contrast to the ample white palette. The White Sun Tribal Plate filled a large wall that was otherwise stark and empty, and the Farmhouse Folding Stool was also a new addition to this area. Kathryn also made easy work of our stunning new photo gallery behind the sofa, mixing tribal and tropical prints with a blend of modern and more rustic frames in black and green to complete the look in the living room. Our lake view garden boasts a selection of cacti and Kathryn made sure that some of these beauties took up residence indoors. 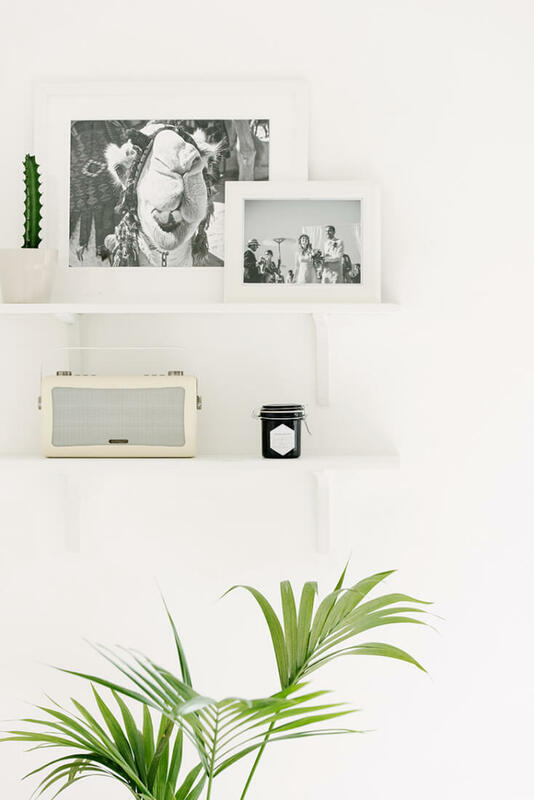 The live greenery adds a vibrant pop of colour, and is always a good idea. 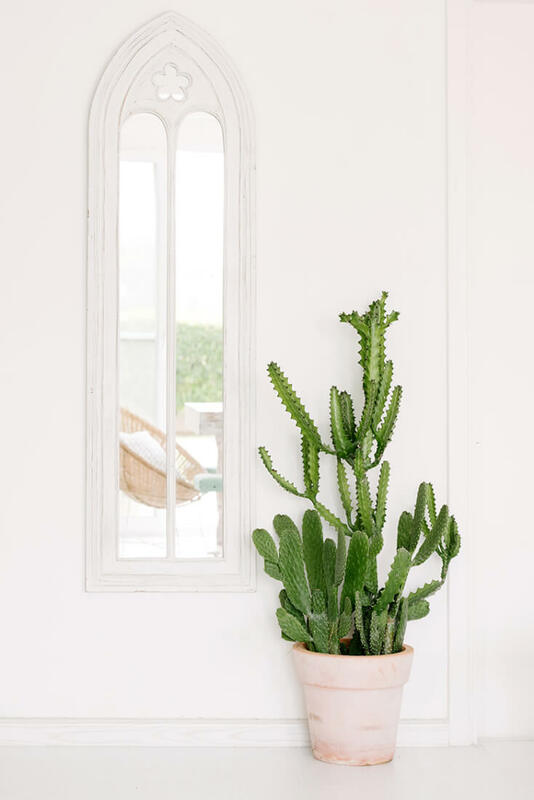 If you’re not blessed with green fingers, or a back garden full of cacti – or if you need to avoid the real cacti in order to preserve curious little fingers, be sure to check out the Rattan Cactus Pot. It would tick the same box and is simply adorable. The subtle use of greenery is echoed by two green frames in the gallery and the upholstered benches in a turquoise suede picked up from my time living in Panama and finally put to perfect use at the dining table. Kathryn placed a Sunburst Rattan Mirror above the console and it makes for a perfect match. This piece is handmade using woven rattan techniques and partners well the Bali Bowl Chairs. All in all, the living room got a pretty cool makeover – helped immensely by the installation of white laminate flooring to cover those white tiles in most rental properties here in Dubai. Upstairs, the master bedroom and nursery (baby White Moss is expected this summer!) share similar tonal values and textures. Kathryn used our Monochrome Tribal Plate as a statement piece above the pallet bed I created from recycled shipping pallets and then added even more texture the room with pieces like the Phonenix Macrame Wall Hanging, the Fisherman Pendant Lights beside the bed, our Half White Seagrass Belly Basket with a tropical palm to add a touch of green and nature and a Raffia Island Pouf at the foot of the bed. 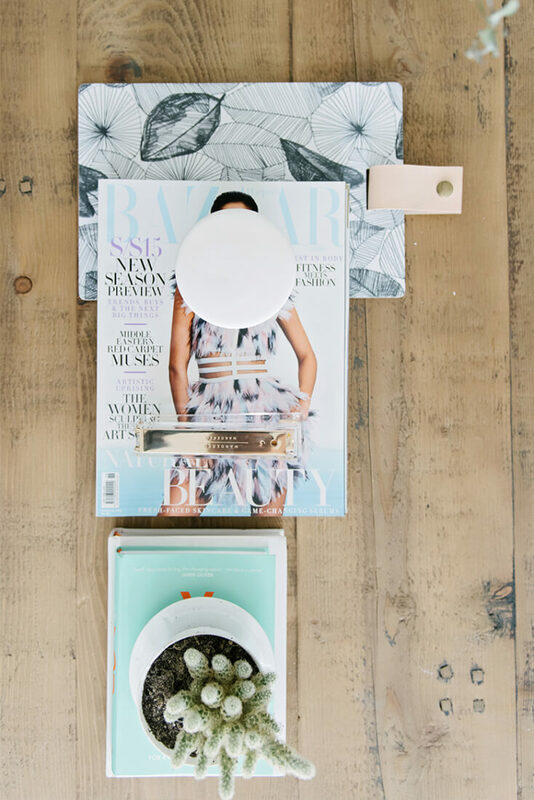 One of Kathryn's all time favourite White Moss pieces is our cute Alice of Wonder stool. This fluffy bunny chair was designed with children in mind as a magical, whimsical statement piece with faux fur seat, natural wood finish and cute little white socks. Here Kathryn paired it with our Bonnie Baby Rattan Crib, rustic whitewash Elephant Head wall hanging and some cure animal throw pillows from our new Joba Collection.